The advance technological method of laser cutting has immensely enhanced jewellery designer’s ability to further explore their creativity and follow through their original visions of detailed intricacy in designs. What initially started off as a jewellery gift to a friend, Laura Guepin developed her love for laser technology, graphic design and architecture into a geometric-inspired jewellery collection aptly titled ‘SharpCloud’. Her pieces showcase her interest in straight lines and angles with the ability to turn a normal outfit into an edgier and modern look. 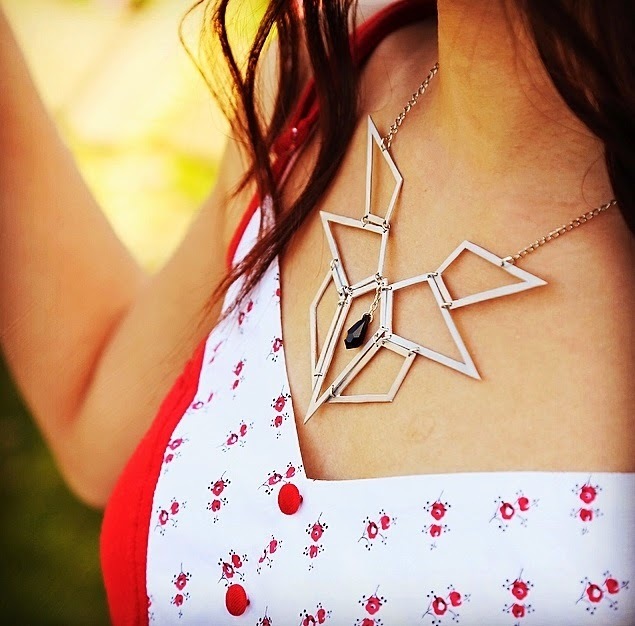 The sharp and defined lines of the aluminium geometric statement necklace against an itsy bitsy cute floral top seems counterproductive at first glance, however the weightlessness of the necklace combined with the thickness of the laser cutting (at least 1mm thick) reduces the bulk of the necklace’s initial appearance. Despite the necklace covering majority of the central chest area it is delicately fine and surprisingly minimalist, contributed by the careful cut outs and mirror finish, with the black stone drop in the centre adding a touch of femininity and contrast. The cut outs are movable to allow Laura to create interesting shapes and fluidity of the piece. The geometric wood necklace is possibly my favourite out of her entire collection and something I would gladly wear everyday. Using MDF as a wood of choice, I prefer the natural look of the material to maintain its nature-given appearance. If you stare closely at one cut outs it has an optical three dimensional effect that is rather mesmerising.